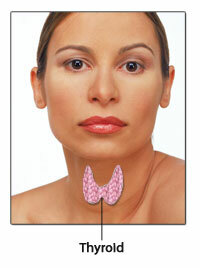 The Thyroid Gland is a hormone producing butterfly-shaped gland located at the base of the neck, just below the voice box. The Thyroid Gland, which is composed of a right lobe and a left lobe, produces and secretes thyroid hormones into the bloodstream. These hormones regulate body temperature, heart rate, blood pressure, energy level, growth rate and weight.